Has Your LIMS Kept Up With the Mobile Revolution? Mobile is dominating our lives as we’re increasingly relying on our phones & tablets for a wide range of both personal and business tasks. We access banking, news, research, email and work systems from the road – whether that means on the soccer field or a far-flung business travel destination. 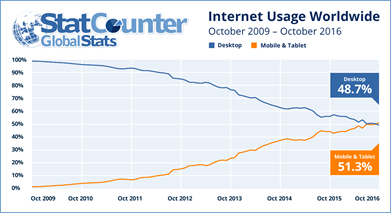 In 2016, mobile usage exceeded desktop/laptop usage for the first time. And, while not yet listed in the Diagnostic and Statistical Manual of Mental Disorders, numerous studies point to a consensus on the existence of cell-phone addiction. In many ways, society has become mobile-centric. There are a number of benefits to using mobile devices with LIMS, from the physical compactness of the device to 24/7/365 access to data from – literally – anywhere. · Unlike a desktop computer, tablets or phones can be brought closer to sources of experiments or data entry, reducing the risk of human error during data entry. · In cases where data is sourced off-site (e.g., remote environment testing), mobile devices can be easily brought directly to remote data sources. · The ability to have instrument status and information accessible outside of normal working hours provides 24/7 monitoring capabilities. · The lower cost of providing and maintaining handheld and mobile devices delivers budgetary advantages when compared to desktop/laptop PCs. But while there are many advantages to LIMS mobile access, there are also some technical challenges. One early challenge, for example, was the use of latex gloves in the testing environment and the inability of capacitive touch screens to register touches. (Newer gloves have anti-static touch screen-capable technologies, so – with the right gloves – mobile access has become less of a barrier to use in certain applications). A key challenge that remains when moving to a mobile LIMS environment is shielded environments, which prevent the use of smartphones and tablets is certain areas. 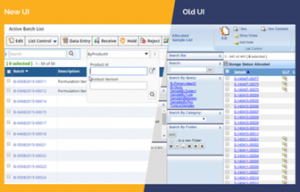 One key challenge with mobile LIMS is user experience (UX). Mobile devices and tablets should be treated differently from a User Interface (UI) perspective. Bear in mind, even smartphones – as a class – have very different resolutions, which can alter how content is displayed on screens. These differences in resolution – including the variances both among different phones and between phones and their larger tablet cousins – have an impact on user interface design, and ultimately the user experience. And I bet you’ve struggled to browse non-mobile friendly websites on a phone too – isn’t the successful implementation of a mobile-focused user interface (UI) crucial to your user experience? · Tablets and desktop versions should be “responsive,” and mobile applications should be “adaptive” (learn more about Responsive versus adaptive design). · Mobile applications should not simply be a cut-down responsive version of the full application (unlike the tablet version), and instead should be a purpose-built mobile application. · Mobile-specific tasks: the design should offer specific tasks (e.g. data entry) that are geared towards the mobile device. · Mobile and tablet versions should provide easy-to-navigate menu systems to access key tasks that rely on mobile devices. · Consider creating purpose-built mobile apps or a website-based application for mobile devices. Example: an app built specifically for barcoding a sample and entering data for that sample. offers an environment responsive and adaptive to layout. permits specified functionality to be displayed in a mobile-friendly way. allows some features (e.g. columns) to be switched on and off, depending on client platform. If your company is investigating mobile access to LIMS to improve workflow efficiency, you may want to learn more about LIMS, mobile design and user experience. Contact us today to discuss your mobile LIMS needs.